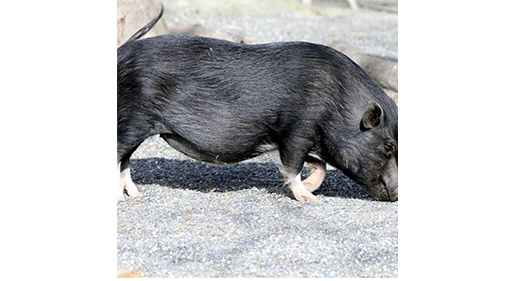 Pigs are very smart and have specific behaviours that keep them happy. These are natural instincts such as rooting for food. They also have no knuckles and cannot grasp anything with their feet, which is another reason they use those excavator-like snouts. Long years have taught pigs to know that the most tempting and tasty morsels are those beneath the soil, so they have become champs at digging with those noses, and even when domesticated, you’ll still see them snuffling through food. Unfortunately, modern farmers practicing small scale or intensive pig farming will lose a lot of feed as pigs habitually root around in their feeding troughs. Of course, pigs’ houses are also places of great competition, and because pigs are raised or kept in groups, it can be incredibly challenging to overcome both waste and keep pigs fed equally and to optimal levels. Whether pigs are farrowing, fattening or at any other point in life, you don’t want some to thrive and others to falter. These are issues in almost all pigs’ houses, and yet there are solutions. Modern feeding systems have been designed to accommodate every stage of a pig’s life, as well as to address that desire to plunge their snouts into the ground or compete for food. Naturally, pigs feed differently as they make their ways through the different stages of life, and whether you are using intensive pig farming, or you are a smaller scale farm, you need to employ the very best equipment for the phase of life. At IDS, you can find a diversity of pigs’ houses, equipment and solutions. Offering bespoke design that goes from assessment, design, manufacturing to installation, the team can support intensive pig farming or smaller ventures. Because the world of modern pigs’ houses emphasizes automation, we can supply you with the kinds of automatic feeders and watering equipment needed to support optimal herds. Of course, it is not all about the needs of intensive pig farming, but also about the needs of the pigs. As the industry becomes more competitive, a farm that can offer stable and comfortable pigs houses is one that has a favourable story to bring to the marketplace. Buyers want to know that pigs are kept well fed, happy and in ideal conditions. Get in touch with IDS today to find out about our pig feeding systems and other pig farming solutions.